My Top 5 moments of “The Melody Lingers On”, A PLL Recap! It’s that time of the week again and we finally get into Alison’s trial! Check out what happened last week here. 5. Andrew is creepy. Don’t trust Andrew and his dimples. In the past, we saw him get close to Spencer and it all seemed harmless, but now he’s been trying to woo Aria. He’s helped Aria look after Mike and managed to get on Ezra’s radar as well. But don’t let those dimples fool you. If we’ve learned one thing on Pretty Little Liars, it’s to trust no one. Basically tonight Andrew reached a whole new level. Amongst talk of the Alison DiLaurentis trial, he brings up being tired of everyone memorializing Mona, implying that they’re all better off without the intelligent girl who’s always one step ahead. Everyone was jealous of Alison, but it looks like Andrew was jealous of Mona. Later in the episode, we see Andrew creeping around Mona’s house. 4. Mona’s house is broken into! During Alison’s trial, Mrs. Vanderwaal is nowhere to be found and the girls are determined to find any more clue Mona left behind. After it appears no one is home, they walk away defeated, but then hear some interesting french music coming from Mona’s room indicating that someone is actually present. They rush to the door which happens to be conveniently unlocked. Mona’s room is in shambles and “A” left a note. But the girls think like Mona and find that “A” didn’t actually find a thing. 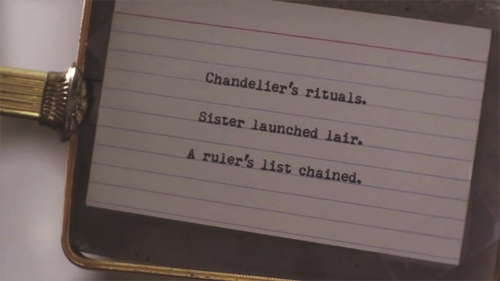 Thinking like Mona leads them to the following clue: “Chandelier’s rituals. Sister launched lair. A ruler’s list chained.” What does that mean? I have no idea. As the girls leave, we see what I mentioned earlier, Andrew watching them from afar. The camera then takes us to a broken window and an ice pick stabbing the floor. We see the ice pick at the end of the episode being examined and it happens to be from the ice cream factory Aria, Spencer and Emily previously visited. 3. “A” calls back. Caleb and the girls spent a lot of time constantly calling the number Emily found, but no one was successful in ever reaching anyone on the other line. Spencer, being the awesome person she is, remembered the number in the personal ads and found that it was the same number! After pestering the number some more, out of the blue, Varjak/A calls Aria’s phone and all they can hear is some french record playing in the background. This isn’t familiar to any of the girls, but it’s familiar to the viewers and Hanna. This is what actually prompts the girls to search Mona’s house for some evidence to get Hanna out. Hanna mentions that Mona used to play a lot of French music in her room. Later in the episode, we see Emily listening in on some secrets on that contraption that Johnny made and she actually hears the french music! How creepy is that?! 2. Jason changes his story. Spencer spends half the episode trying to speak to Jason about the trial and Ali’s innocence. She constantly tries to apologize and seems to be one of the factors in Jason changing his story. If you don’t remember what Jason said, here’s a little refresher: Mr. D and Jason backed up Ali’s alibi that she was home and then Jason ended up taking that back saying she was actually away. When he was shown the video of Mona getting attacked he even said that the blonde girl may be Alison, but during his testimony he basically says he doesn’t believe that Alison did it. Mrs. Hastings suggests that the girls don’t go, mainly Spencer. She’s so worried about what everyone will think of her daughter. Emily and Aria end up going the first day, but Spencer actually listens to her mom. But we all knew Spencer couldn’t stay away. And let’s just say that Mrs. Hastings was not a happy camper. Alison calls Emily and all the Emison shippers had a glint of hope. Honestly, I never really liked Emily with anyone else but Alison. I know, I know..they had a toxic relationship, but a part of me is still rooting for them. The prosecution knew that Alison lied about her supposed kidnapping, making the other girls targets as well. After Mr. DiLaurentis found out they knew about Alison’s lies, he accused them of convincing her to do so. I get that Mr. D is defending his daughter, but for some reason I was very annoyed with his behavior. Alison’s trial continues next week and from the looks of it we’ll learn the jury’s verdict (unless they leave us with a cliffhanger). I’m hoping the girls decipher Mona’s note, because I’m still stuck on what it is. I just want to see both Hanna and Alison out of the orange jumpsuits and back with the others to take down the real “A”. With that being said, we’re one episode away from “the big reveAl” and I’d love to hear your thoughts and theories so far! This entry was posted in Entertainment, Lists/Favorites, Pretty Little Liars, Recaps and tagged ABC Family, Alison DiLaurentis, Aria Montgomery, Ashley Benson, Emily Fields, Hanna Marin, Lucy Hale, PLL, Pretty Little Liars, recap, Sasha Pieterse, Shay Mitchell, Spencer Hastings, television, Troian Bellisario on March 10, 2015 by Adele Fredeluces.